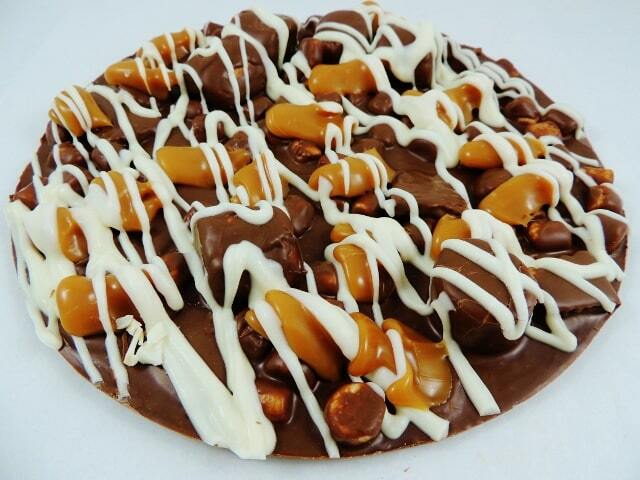 Our chocolatiers took the popular Campfire Chocolate Pizza to the next level when they created the 20 ounce, Smore Chocolate Pizza with Caramel – or as we commonly refer to it, Caramelicious! 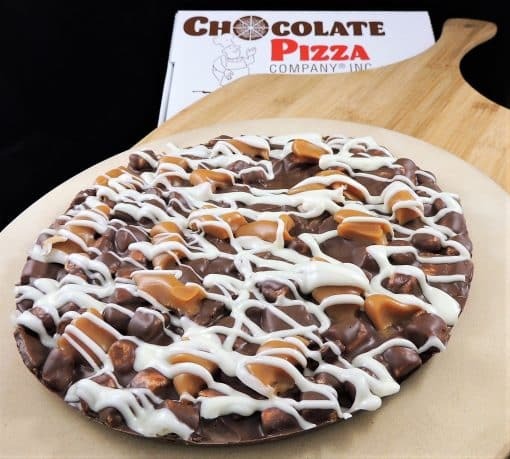 Full size roasting marshmallows, mini marshmallows and chunks of graham crackers are blended with gourmet milk chocolate (no toffee in this one) before landing in a genuine pizza pan where dollops of soft, chewy caramel are added. 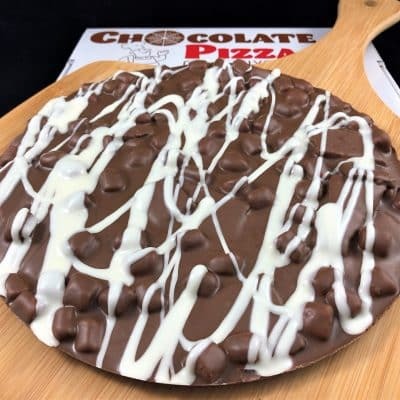 We finish with a white chocolate drizzle, seal it in clear cellophane and serve it in a custom pizza box. Add our famous Peanut Butter Wings for a “Pizza & Wings Combo. 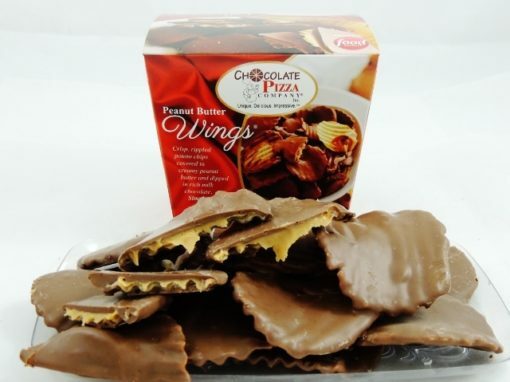 Our Wings are crisp, rippled potato chips covered in creamy peanut butter and drenched in rich chocolate. Enjoy! 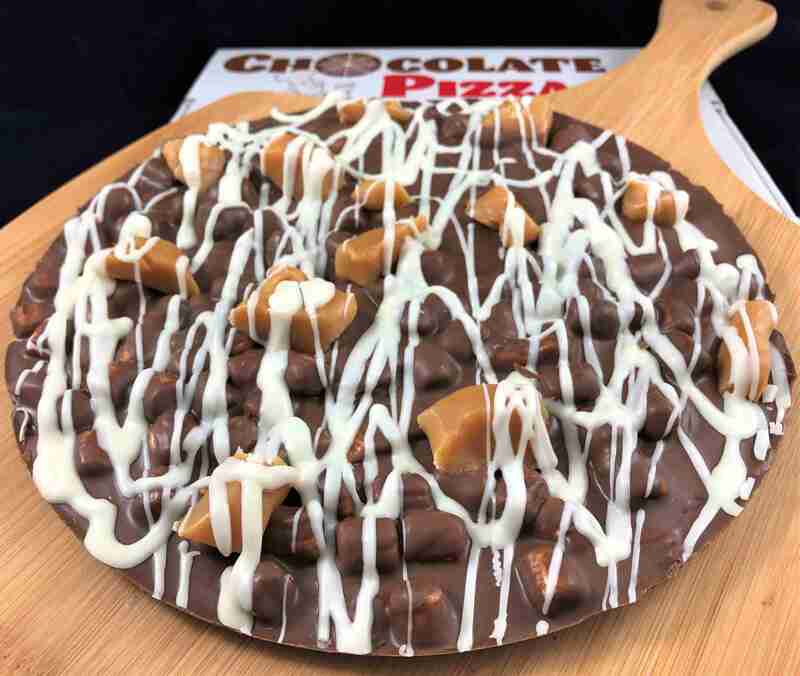 Our chocolatiers took the popular Campfire Smore Chocolate Pizza to the next level when they created the 20 ounce, Smore Chocolate Pizza with Caramel – or as we sometimes refer to it, Caramel-icious. 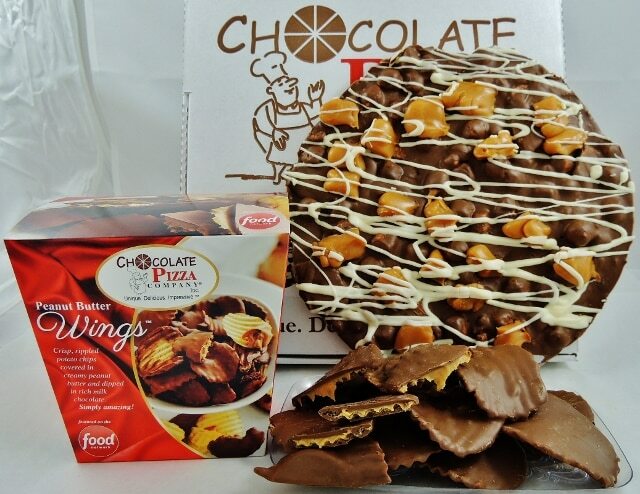 Full size roasting marshmallows, mini marshmallows and chunks of graham crackers are blended with gourmet milk chocolate (no toffee in this one) before landing in a genuine pizza pan where dollops of soft, chewy caramel are added. We finish with a white chocolate drizzle and presto, Smore Chocolate Pizza with Caramel is ready to wow your taste buds. Sealed in clear cellophane and presented in a custom pizza box. Add our famous Peanut Butter Wings for a “Pizza & Wings Combo. 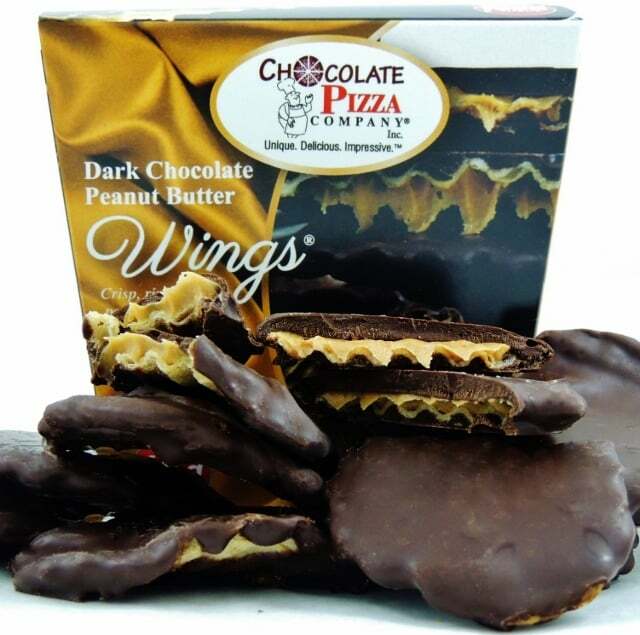 Our Wings are crisp, rippled potato chips covered in creamy peanut butter and drenched in rich chocolate. Enjoy! The gently rolling hills of Upstate New York are home to one of the best gourmet chocolate manufacturers in the country. 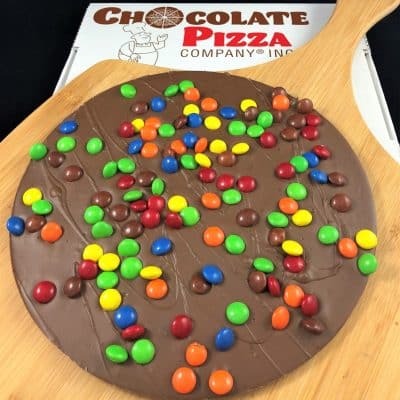 Chocolate Pizza Company started here about 30 years ago in the small village of Marcellus. 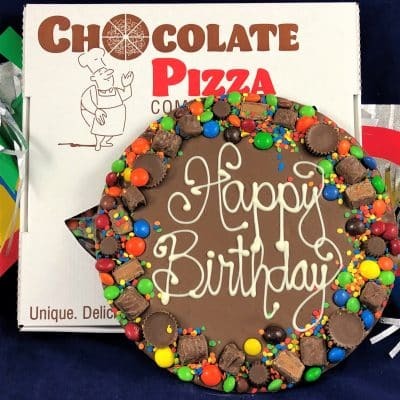 But what started as a quiet business has grown into an emerging national brand as the America’s gold standard of Chocolate Pizza. Food Network, Food Network Canada, NBC’s Today Show, ABC News and other major media have all featured our gourmet chocolate specialties. Chocolate Pizza blends the highest quality Swiss-style chocolate with homemade English toffee. We do make Chocolate Pizzas without the toffee blended in, like the Smore Chocolate Pizza with Caramel, and its cousin the Campfire Smore Chocolate Pizza. Everything we make is handcrafted and American-made.